Leila Malcal is the daughter of a Britannian noble family that disagreed with the dated system of rule in the empire, which made them defect to the E.U. as exiles. Born in Europe, Leila was adopted by the Malcal family after the deaths of her parents. She became a Major in the E.U. Army and originally served as an adjutant to Commander Anou in the W-0 Unit. Leila planned the military operation known as Operation Alpha with the objective of rescuing the surrounded 132nd Regiment in Narva. However, Leila confronted Anou over his last minute decision to use Japanese youngsters for suicide attacks and finally removed Anou from his command position. After the success of the operation, she was promoted to the rank of Lieutenant Colonel by General Smilas and given direct command of the W-0 Unit. In the first episode, it was directly implied that she may have a Geass power during the sequence where she stood up to her commanding officer. The third episode directly states that she has Geass, but its specifics remain unknown. 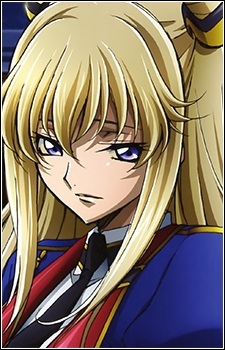 It is hinted that she can save Akito from Shin's Geass by the "great nanny". In the fourth episode, her Geass activates when Shin attempts to kill her with his Geass, causing him pain as a result of the backlash in the same eye his Geass is on. It is unknown as to whether she realizes she used it or not. It also shows that her Geass is blue can negate other Geass, much like Jeremiah Gottwald's Geass canceler. This implies that she has a natural version of said canceler.